A 15-day walking tour visiting many of Tasmania’s wilderness national parks and reserves and featuring a variety of walking landscapes (alpine, sub-alpine or coastal) grades (challenging or moderate) and gradients (steep or level). Several destinations offer a variety of walks to suit a range of fitness levels and routes can be varied to suit. As a contrast, the tour also includes a lazy mid-tour cruise on Macquarie Harbour to vary the style and pace of the walking activities and concludes with an exciting seaplane flight from the Tasman Peninsula*. The tour is fully catered and accommodation is provided in twin-share facilities. 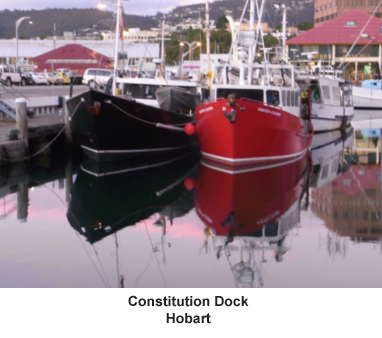 Hobart is Australia’s second oldest capital city. Settled in 1804 on the banks of the Hobart Rivulet at Sullivan’s Cove to provide a solution for Britain’s burgeoning convict population, it is now a modern, lively city with a very active arts and crafts culture, coupled with superb locally-sourced natural produce. Its cultural credentials are nowhere better demonstrated than at the refurbished Tasmanian Museum and Art Gallery (TMAG), the superbly restored Theatre Royal, or the extravagant Museum of Old and New Art (MONA) at Berriedale. These attractions are contrasted with the relics of its convict heritage at the Port Arthur Penal Settlement and many other convict sites and towns around the State. On arrival at Hobart, this day is yours to explore and familiarise or reacquaint yourself with Hobart’s delights, prior to meeting at the Hobart Mid-City Hotel, corner Elizabeth and Bathurst Streets, Hobart, at 4:00pm, which is our accommodation for this evening and where we’ll enjoy a group dinner and tour briefing. The walk is characterised by the park’s multiple ‘personalities’ – starting in a sub-alpine forest along moraine-dammed lakes, and finishing with an exhilarating high altitude ridge-top traverse of the Rodway Range among the ice-shattered monolithic dolerite boulders of the ‘Lions Den’ before descending the botanic ‘riot’ of the Urquart Track to our finish. Our accommodation this (and the following) evening is at the Giants Table Cabins in Maydena. We reach the peak after ascending beneath the canopy of a magnificent, pristine rain forest, then a sub-alpine belt of pandanis, scoparia and heaths, and finally scramble up a dolerite boulder-strewn gully and several ‘false’ summits to gain access to the small summit plateau. The views from the top are sensational – the whole panorama of the southwest is before you, from the lakes below to Frenchmans Cap, the ‘ice-chewed’ Arthur Range and Mt Anne, and even glimpses of the Southern Ocean beyond. We return to the Giants Table Cabins for our evening dinner. Mt Anne (1425m) is the highest mountain in Tasmania’s southwest. From Condominium Creek we climb the steep spur from the button grass plain through mountain forest and past High Camp Hut, taking in the spectacular views of Lakes Pedder and Gordon, before negotiating an incredible boulder field leading to Mt Eliza’s alpine plateau. Lake St Clair, Australia’s deepest lake at 220m, is the source of the Derwent River. It was gouged out by a glacier during Tasmania’s most recent glacial period (18,000 – 12,000 years ago) and dammed by a terminal moraine at Pump House Point. The button grass plains approaching Derwent Bridge are the outwash plains created by the glacial melt water discharge. This evening’s meal and accommodation is at Lake St Clair Lodge, where we will stay for two nights. Today we walk to Mt Rufus (1416m), climbing steadily through the sub-alpine vegetation to breach an encircling escarpment of Triassic sandstone cliffs before ascending to the summit cairn (an impressive structure built by the early colonial surveyor, James Sprent). The views from the summit over Mts Arrowsmith and Hugel, and the Cheyne Range (all composed of dolerite rock) and Lake St Clair are sensational. We complete the circuit walk by descending to the track through Richea Valley with its pandani plants before joining the Shadow Lake/Mt Hugel track along an ancient lateral moraine to return to our starting point and the Lake St Clair Lodge for the evening. Our first stop is the Franklin River nature trail. Our next stop is at Donaghys Hill walk – another short walk to a viewpoint high above the Franklin and Collingwood Rivers with a fine view to the quartzite peak of Frenchmans Cap in the near distance. We walk through a variety of plant communities, including a close encounter with button grass before reaching our viewing platform. Our last short walk is at Nelson Falls – a pretty waterfall tumbling off the nearby ancient sandstone escarpment. From here we continue to Queenstown where our evening’s accommodation is at the West Coaster Motel. We’ll leave Queenstown early to catch our cruise vessel operated by World Heritage Cruises and departing from the picturesque Strahan wharf. The cruise includes an exciting passage through Hell’s Gates (the narrow and potentially dangerous entrance to Macquarie Harbour), a guided tour of the ruins of the notorious convict station on Sarah Island and a cruise up the tannin-stained waters of the Gordon River to the Heritage Landing Walk where you can view centuries-old Huon Pines. The cruise also features a full buffet lunch. From Strahan, we’ll journey to the mining town of Zeehan where we’ll overnight at the Heemskirk Motor Hotel. We’ll leave Rosebery early for our short drive to the Mt Murchison trailhead for our walk. Mt Murchison (1278m) is a formidable and challenging scramble, with a short climb through a rainforest after the start of our ascent, followed by a further scramble above the glacial cirque and a traverse of a narrow ridge to the summit. We skirt several small tarns on the ascent, flanked by Tasmania’s only deciduous tree, the myrtle beech or fagus (Northofagus gunii). From the summit we can view the Southern Ocean to the west, almost all the Overland Track peaks to the east – a stunning vista – before we pick our way carefully back to our starting point. We then drive to Cradle Valley, where we’ll spend the next two days exploring this region. We’ll be staying at the Discovery Holiday Park whilst at Cradle Valley, and dining at Pepper’s Cradle Mountain Lodge at their Tavern Bar & Bistro. Montezuma Falls at 104m are one of the highest falls in Tasmania, and are deep in the rainforest near Rosebery. The area is rich in early mining history however little remains now except the bed of an old tramway track built to provide access to the Mts Dundas and Read mining fields, remnant rotting rail sleepers, a fine old suspension bridge, and a mine adit adjacent to the falls. Today is a chance to do a full day of walking around Cradle Mountain. There are many options to choose from, ranging from easy strolls to challenging climbs (T1 to T2). Accommodation is at the Discovery Holiday Park and we will be dining at Pepper’s Cradle Mountain Lodge at their Tavern Bar & Bistro. Our trailhead starts near the Hydro Village of Gowrie Park and ascends an old 4WD track in a charming eucalypt forest before arriving at O’Neills Creek. From here the track becomes narrower and rougher before emerging from the enclosing forest on the saddle between Mt Claude and Mt Roland. Now in an open sub-alpine landscape, we complete our climb to the summit of conglomerate rock with views north to Bass Strait, west to Table Cape at Wynyard, east to Mt Barrow near Launceston, and south to the Overland Track peaks. After our descent, we then continue to the delightful town of Deloraine with the Great Western Tiers as a backdrop for our evening’s meal and accommodation at the Mountain View Country Inn. On our mid-afternoon arrival from Deloraine we have several options – we can visit East Coast Natureworld*, explore the Lookout Track Circuit at Douglas-Apsley NP, or walk to either the Bicheno Blowhole or to the top of Whalers Lookout, a granite knoll near the town centre. For our dinner tonight we’ll dine at Sea Life Centre, and we have a further option of joining a tour to the Penguin Rookery* in the evening before settling down at the Silver Sands Motel for the night. Stunningly scenic and iconic destination featuring memorable ocean and bay views, with pristine beaches and crystal clear waters. The Freycinet Peninsula, on Tasmania’s east coast, is the location of the exquisite and renowned Wineglass Bay and the photogenic red granite peaks of The Hazards. It enjoys a mild year-round climate: warm and dry in summer, cool and temperate in winter. It also boasts some of the east coast?s most secluded and pristine beaches, with breathtaking views of Wineglass Bay from either the summit of Mt Amos (454m) or the saddle on the track to Wineglass Bay. We have several options for our walk today: either a scramble to the summit of Mt Amos (454m, T2 4km 394m) for the views (with lunch at the summit), or a walk around Fleurieu Point to Hazards Beach (named after the wreck of Captain Albert (Black) Hazard’s whaling vessel, the Promise) and then over the isthmus to Wineglass Bay (for lunch) with a return via the saddle and the lookout between Mt Mayson and Mt Amos T1 9km 220m). 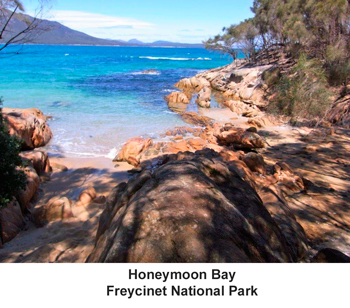 Other walk choices could include a visit to Honeymoon Bay, the Friendly Beaches, Cape Tourville or Sleepy Bay. We then continue to the quaint fishing village of Triabunna for our evening’s meal and accommodation at the quirky and historic (from 1838) Spring Bay Hotel on the waterfront, before our early start the following morning to catch the ferry across the Mercury Passage to the Darlington Settlement on Maria Island NP. We have many options while on the island: we can explore the forlorn settlement, which features a fascinating mix of former penal activities (dating from two periods: 1825-32 and 1842-50), to later failed tourist endeavours (1884-96) and the visually jarring remains of the failed cement works (1920-28) set amidst the idyllic backdrop of exquisite coastal and mountain vistas; or walk to the remarkable iron-stained Painted Cliffs nearby; or stroll to the convict built reservoir (built over 140 years ago); or visit and explore the Fossil Cliffs high above Fossil Bay (with marine fossils dating back to between 250-290 million years ago); we can scramble up Mt Bishop and Clerk (599m, T2 12km 590m) – high above the Fossil Cliffs – with brilliant views from the remarkable ‘tabletops’ of the sheer dolerite columns); or we can just continue our exploration of the Darlington settlement and be entertained by the antics of the Cape Barren Geese, native hens, wallabies, wombats and kangaroos. At the end of the day we return to Triabunna on the island’s catamaran for the 45-minute crossing of Mercury Passage before joining our bus for the trip to Eaglehawk Neck on the Tasman Peninsula where we’ll stay at the Lufra Hotel. A dramatic assemblage of dolerite columns and sea stacks thrusting from the Tasman Sea. The Tasman Peninsula, just one hour from Hobart, features some of Australia’s tallest sea cliffs, and this walk provides an opportunity to view these firsthand as well as enjoy some spectacular coastal scenery. At the conclusion of this, our final walk of the tour, we’ll take an exciting seaplane flight* to Hobart from Stewarts Bay on the Tasman Peninsula with Tasmanian Air Adventures. Our evening’s accommodation is again at the Hobart Mid-City Hotel, and for our last night together we’ll enjoy a final group dinner at the Wrest Point Casino to conclude the tour. This day is yours to enjoy as you will – visit the Salamanca Market, the Port Arthur Settlement, the Tahune Airwalk at Geeveston (although you might have had enough of rainforests by now), catch an arthouse film at the superb and intimate State Theatre in North Hobart, or catch Rob Endicott’s jaw-dropping Bruny Island Cruise before you make your way back to the mainland. Read what one of our clients has blogged about this tour. Click here to read her review of our Tour and click here to see her photos of our Tour. We reserve the right to modify the walks or select alternative destinations as deemed appropriate by our Guide(s) taking into account prevailing/forecast weather conditions and client safety. We reserve the right to book alternative accommodation if necessary subject to capacity and bookings. Payment terms: 10% deposit on booking, balance 7 days prior to tour departure. Please click here to refer to our Tour Inclusions (what we provide on your tour). For further information about National Parks in Tasmania, click here to visit the Parks & Wildlife Service Tasmania website.